Some may see HD collections and rereleases as cash-ins - an easy way to make a quick buck on a beloved classic with little work. But that's way too cynical. In many ways, the HD rerelease offers an opportunity for an all-new audience to discover a game they might've missed, as well as a chance for veteran gamers to experience an old favorite all over again without having to dust off outdated hardware. As publishers and developers try to find ways to respect their history while still taking advantage of the power new consoles often afford, many games ripe for the remastered, HD-ification treatment tend to fall through the cracks. These are the HD collections and upgraded ports we're still hoping to see on PS4 and Xbox One some day. Onimusha hasn't been heard from in years and is well overdue for a comeback. Blending Resident Evil-style exploration and horror elements with Devil May Cry-esque hack-and-slash and leveling up, Onimusha followed multiple samurai protagonists through demon-fighting adventures in feudal Japan (with a quick, lavish-looking detour through modern-day Paris thrown in toward the end). Nioh comes close to the same atmosphere as Onimusha, but it just makes us all the more nostalgic for the original article. Ideally, an HD edition would bring together at least the original trilogy (preferably with the Genma Onimusha version of the first game, which featured added content, greater difficulty, and a creepy doll that chased you relentlessly through the game), but because this is a wish list, we'd love to see it bring in Dawn of Dreams as well. The fourth Onimusha game took place about 15 years after the events of Onimusha 3, featured a new protagonist, and had the misfortune to ship in March 2006, when everyone's attention was focused on the just-released Xbox 360 and the impending PlayStation 3 and Wii. Tossing it into an HD collection would give it a second chance at life and, more importantly, give those who ignored it the first time around an excuse to play through it. Oh, and as long as we're dreaming? Hearing Jean Reno record his own English lines in Onimusha 3, instead of stand-in Paul Mercier, would be fantastic. Mass Effect: Andromeda may not have been the sequel we were hoping for, but I know a way to make everyone forget about how tired everyone's face was: release the original trilogy on PS4 and Xbox One. Commander Shepard's space adventures are easily some of the best games of the previous console generation, even barring Mass Effect 3's less-than-satisfactory ending. Relive your bromance with Garrus, fall in love with Tali all over again, or maybe play as a Renegade this time around. There are ways you can play the originals on modern platforms, whether you pop a disc into your Xbox One or just play them on your PC. But Mass Effect would benefit greatly from an enhanced box set for modern platforms, featuring updated textures, lighting, and a general technical overhaul to provide a much better and more stable experience than before (especially for that first game, which can look a bit… rough these days). Plus, EA could throw in all of the DLC for each game in the series - something that the Mass Effect Trilogy box set for Xbox 360 and PS3 didn't even do. It'd be a fantastic mea culpa to Mass Effect fans, and a great way to show newcomers why Mass Effect is one of the greatest video game franchises ever made. Back before all shooters had to be ultra-serious and ultra-realistic, TimeSplitters carved out a niche for itself with a blend of overt silliness, wildly varied action, excellent multiplayer and three games that didn't really have much to do with each other aside from a habit of jumping around through different time periods. The series is nearly two decades old at this point (the first game launched alongside the PlayStation 2), making it seem especially worthy of HD preservation. A TimeSplitters rerelease has been teased for years, but nothing's ever come of it. In a 2008 interview about TimeSplitters 4, David Doak, head of developer Free Radical, mentioned that he'd be interested in remaking TimeSplitters 2, widely considered the best game in the series, with HD visuals and online multiplayer. Heck, Free Radical was even bought out by Crytek a few years back, but other than a few peeps gauging potential interest here and there, nothing concrete has surfaced. Well, we can dream - and if they're going to remake one, why not all three? Silent Hill and Resident Evil are widely regarded as the two best and most important horror franchises of the past decade, but there's another horror series from the PS2/Xbox era that doesn't come up in conversation quite as often. One that's given us some of the most frightening moments we've ever experienced in any game, ever. Fatal Frame's concept of a magic camera to fight off ghosts sounds silly on paper. But the series' dark, cramped interiors and slow-moving, first-person fight sequences seamlessly combined to create a sense of claustrophobic tension, which was only worsened when pale, disfigured specters slowly crawled out of dark spaces and floated forward to menace you up close. The games and their scares still hold up alarmingly well, but as much as their blurriness adds to the ethereal feel of the game, we'd still like to see them get a fresh coat of paint and a second chance at life. When you see Suda51's name (or his studio, Grasshopper Manufacture) appear on the cover of a game, you know you're in for wild trip. Many of Goichi Suda's works exist within genre conventions - the hack-and-slash action of No More Heroes or third-person shooting of Shadows of the Damned - but they also use those conventions to subvert your expectations with out-of-left-field design decisions or idiosyncratic narratives. As such, most of his studio's games are cult hits, often existing right on the cusp of wider pop culture success. But with the relative popularity of his studio's free-to-play game Let It Die, along with the recent release of his first independent adventure game The Silver Case on PC and PS4, now's the perfect time to compile a bunch of Suda's console games into a single package for modern platforms. Flower, Sun, and Rain's strange adventure only got a limited release on the DS. No More Heroes and its sequel could finally get the respect they deserve and build up excitement for whatever Suda51 has cooking for Nintendo Switch. 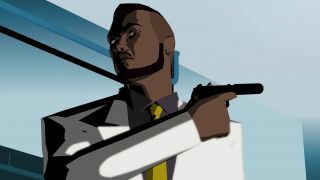 And of course, Killer7 - the game that put Suda51 on the map - could finally break out of its GameCube and PS2 prison. Suda51's games don't deserve to languish in obscurity, and a proper HD collection could be the chance they need to find a new audience. Ok, so, this is cheating a little bit, mostly because Nintendo already compiled all three Metroid Prime games into a single collection on the Wii. But even as great as that collection is - with added widescreen and Wii Remote controls that actually enhance the game - none of the ports are in HD. The Nintendo Wii could only support up to 480p through component cables, and the system's lacking horsepower meant that the games didn't look all that better than their GameCube counterparts. Now, imagine a proper Metroid Prime HD Collection on Nintendo Switch. Play all three games in 1080p with upgraded graphics and a blazing 60 frames a second on your TV, then take them with you via the system's handheld mode. Choose between Wii Remote controls - which are mapped seamlessly to the new JoyCons - or the more traditional controller configuration from the GameCube release in all three games. It would be the definitive release of some of the finest games of the series. Hey, where are you going? Get back here. I know, I know, Final Fantasy 13 ruined the series forever; it's just one big long corridor, every line out of Snow's face makes you want to punch him, etc. Some of the complaints levied against the Final Fantasy 13 trilogy are generally warranted, but a lot of it is hyperbolic, borne out of its failure to live up to its own hype. Time and distance lends new perspective, though, and I think it's time for Final Fantasy 13 to get a second chance. The Final Fantasy 13 collection would include the increasingly ridiculously-named Final Fantasy 13, Final Fantasy 13-2, and Lightning Returns: Final Fantasy 13, along with all of their DLC. On top of being an entertaining mess of exhilarating combat and inscrutable plot threads, compiling all three games in one place provides an important history lesson on a company going through the painful transition to then-next-gen platforms. Plus, more people need to play Lightning Returns, as it's secretly one of the best, most unique Final Fantasy games ever made (and a pretty good metaphor for the entire FF13 trilogy, to be honest). There are workarounds if you want to play Rockstar's premiere open-world Western on new devices, but they either require backward compatibility with the original game (in the case of Xbox One), or PlayStation Now's less-than-ideal streaming subscription-based solution (on PS4 or PC). No, Red Dead Redemption (along with its stand-alone DLC, Undead Nightmare) deserves a proper, current-gen update, especially with the sequel on the way. Details are light about the upcoming sequel, but if the rumors are true, then it's probably going to be a prequel to the events of the first game - which might be handy to know if you're planning on hopping into the second one. Even barring that, the story of James Marston and his quest for revenge is a rare, properly mature story in video games, and one that deserves to be remembered as a modern classic. Plus, Undead Nightmare is just ridiculous fun, as it takes the framework introduced in Red Dead Redemption, and turns it into a survival action game filled with zombies. Each game in the Persona series is exponentially more successful and popular than the last, and Persona 5 has officially exploded onto the scene to rave reviews and enormous sales. Of course, this means that there are a lot of people out there who haven't played the other games in the series, and everyone deserves to discover the magic of Persona 4 Golden for themselves. A Persona collection would include each one of the main entries of the series, including both Persona 2: Innocent Sin and Persona 2: Eternal Punishment, all the way up to the beloved fourth entry, along with all the bells and whistles that have been added to the various rereleases over the years. That way, players can see how the series evolved from its original PlayStation roots to the combination JRPG/high school sim we know and love today. Yakuza has long felt like it was doomed to be forgotten. Sega went all out in localizing the first game, hiring top Western voice talent for all of its characters - only to have all of it land with a giant thud. Each entry that followed felt like they were met with more and more reluctance from its publisher, the second game opting for a Japanese dub over English voice overs and arriving in very limited quantities, the third game coming out with swaths of content missing, the fourth years after it released in Japan. All of that changed with arrival of Yakuza 0, though. Now, Western PlayStation 4 owners can experience the prequel to the entire series, an upcoming remake of the first game, and the most recent game in the series over the course of the coming year. But even with this recent resurgence of popularity and awareness, that still leaves Yakuza 2-5 (and its various spin-offs) locked to older platforms. It would be a huge undertaking, but if any series deserves an opulent box-set of six newly HD-ified PS4 games, it's this one.